For the fifth year in a row, The Merc Playhouse is pleased to present another touring production from Seattle University’s Performing Arts & Arts Leadership Department. 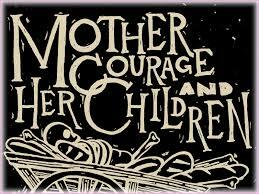 Mother Courage, by Bertold Brecht, is considered one of the greatest anti-war plays ever written, set in wartime while a fierce, indomitable woman fights to make a living and keep her family alive. With one son who is too daring, one son who is too honest, and a daughter who stays mute, Mother Courage chases profit and does whatever it takes to survive the nightmare of war. Brecht’s masterpiece is funny, sad, and unrelenting as it scrutinizes the impact of war on ordinary people. Featuring Ki Gottberg, the Merc’s outgoing Artistic Director in the titular role, guest artist, Andrew Litzky, artistic director of Theatre Simple, as the Cook, and a cast of Theatre students from Seattle U, this evening is sure to sell out, as did last year’s tour of The Tempest. Get your tickets early! DATES: Sat, Dec 2, 7pm. Doors open 30 minutes prior to show time. TICKETS: $16-$18/adults, FREE general admission for students 18 and under. Tickets available online. Limited reserved seating online only. LOCATION/INFO: The Merc Playhouse, 101 S. Glover Street, Twisp, www.mercplayhouse.org. 509-997-7529.